I can't tell you how excited I was to finally bust out this fabulous coat from Blush Shop. Oversized, fuzzy and gold sequins? Major swoon. Another swoon? This Lisi Lerch Gold Tassel Necklace. This adorable collection of earrings, bracelets, necklaces and more is such an eclectic mix that is truly diversified. As we begin to pile on layers of coats, sweaters and hats, it's fun statement necklaces such as this which truly make an outfit stand out in a sea of greys and blacks. The amazing team behind Lisi Lerch want you to make a statement with the same necklace so we're giving one away to a lucky reader! So get hopping on those entries below to snag this amazing piece of fun for yourself! I like that camel and white polka dot shirt! Awwwww totally major swoon! That coat is incredible!! So cute! Wear it as much as possible...feeling like it is going to get VERY cold, VERY fast. Oy. You look fabulous!!! That coat is gorgeous!! You are so darn cute! 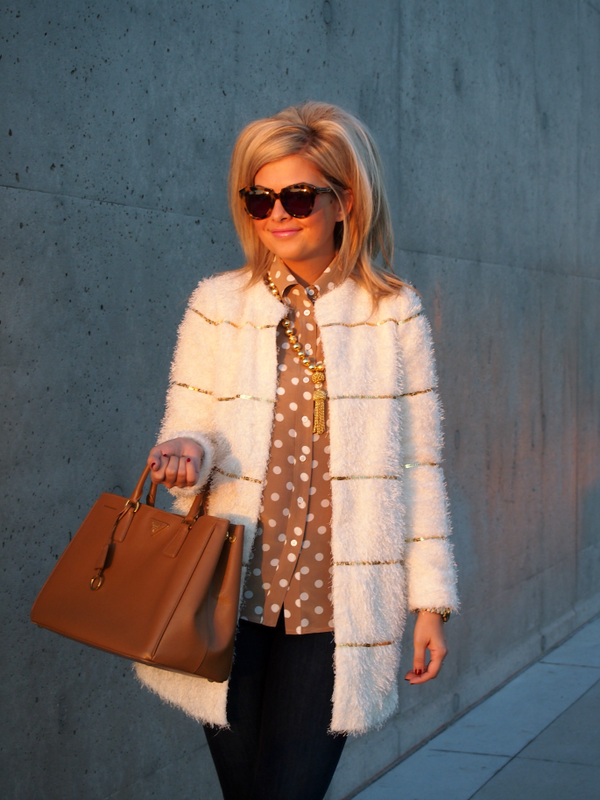 I love the coat & blouse together! Darling has become one of my very favorite brands, and this coat is no exception! SO fun! I see why you like the coat so much... very cute! LOVE that blouse, too! love how this coat looks on you! This looks so cozy yet so chic! That coat. I could die over it! How freaking cute is it! I was on a hunt for a trench forever and now I think my focus has switched! that is so pretty, and looks adorable with your polka dots! That blush shop coat is amazing! Love the coat & necklace. I absolutely love the volume in your hair! Wish my hair could pull that off. Gorgeous outfit, as usual. That coat is lovely! You always have the most amazing Giveaway's and I seriously hope someday I get to win one. Also I love your style. In love with this entire look. AMAZING! OBSESSED with this coat! Too perfect.